SoundTracker® System – Cuts noise up to 90% for clearer communications. NOAA weather & emergency radio – Be prepared for storms and emergencies with built-in NOAA radio receiver. Dual Watch – Monitor 2 channels simultaneously. Instant channel 9/19 – Immediate access to emergency channel 9 or information channel 19. Scan – Activates scan of all 40 channels. 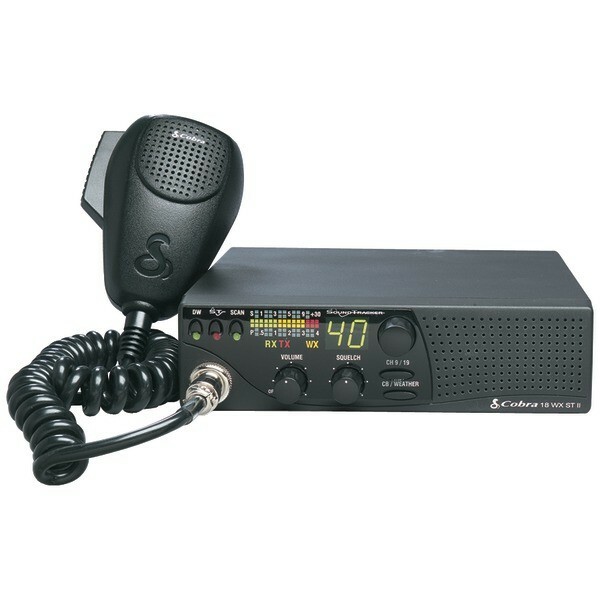 The 18 WX ST II is a 40-channel CB radio with 10 NOAA weather channels and a front-firing speaker, making it ideal for under-dash mount. The SoundTracker System reduces noise for clear communication, and the unit’s compact design makes it ideal for recreational vehicles.